The MT-1000 is a microscope translator, fixed-stage and manipulator platform for moving optical pathway electrophysiology. The modular design of the MT-1000 features free-standing columns that provide rock solid mounting for the tissue recording chamber and multiple micromanipulators, such as the MP-285 or MP-225. The columns are positioned around a movable table that provides X-Y translation of the optical pathway in order to view multiple locations within the chamber at high resolution. The column-mounted recording chamber is relatively compact and serves as an alternative to bulky stages. The modular columns allow easy access to the microscope and provide a very flexible design platform for customizing your rig. At the core of the system is the X-Y translation table. 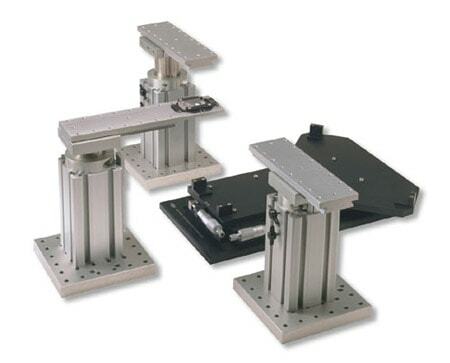 It is designed to allow movement of a microscope’s optics with respect to the fixed stage. Such an arrangement is currently in use by electrophysiologists recording from tissue slice preparations. The translator allows visualization and/or imaging of multiple tissue locations while maintaining multiple stable recordings from the preparation. Such a system is also useful for experiments on cells in culture where one wishes to monitor several cells not in the same field of view, e.g. recording from pre and post synaptic neurons in culture and/or imaging one cell while recording from or stimulating another. Translators are available for the Olympus BX-51WI, Nikon E600FN, Zeiss Axioskop 2 FS and the Leica DMLFS as well as older fixed stage models. A generic rectangular table (295mm x 340mm) which can accommodate most standard, upright microscopes as well as a number of inverted microscopes is also available. The recording chamber and micromanipulators are mounted on independent columns firmly affixed to the user’s vibration isolation table. The manipulator columns are identical to the popular MT-75 gantry style stands. The recording chamber fits into a dovetail slide on a similar column. While the chamber column shown conforms to a Warner Instruments Series 20 design, other chambers can be accommodated. A dovetail slide with a generic opening is available for users who wish to develop custom chambers.